I gave up going to church long ago, but being able to partake of some vices while at mass only could have helped attract a bonafide heathen like myself (although it sure seemed like some of the priests in my childhood parish were hitting the communion wine a bit hard). So I read with interest this BBC account of a Guatemalan church in the town of San Andres Itzapa in Chimaltenango, west of Guatemala City. 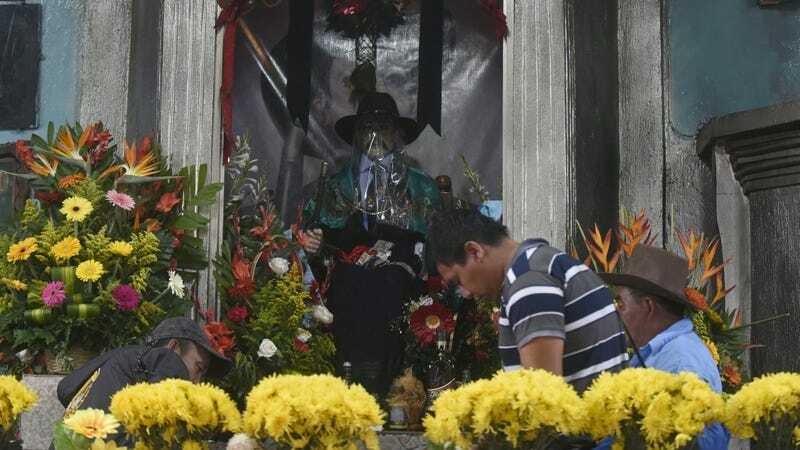 The church is devoted to San Simón, a saint not recognized by the Catholic Church, as he is believed to be the protector of the homeless, prostitutes, alcoholics, and drug-traffickers. His followers bring him offerings of alcohol and cigarettes; there’s a liquor store in the church for this purpose, and also for church attendees to enjoy. The worshipers pray at the altar of San Simón, dousing him with rum and leaving him packs of cigarettes. His statue has a plastic veil over his head because people kept trying to put lit cigarettes in his mouth, creating numerous fire hazards. Granted, drug use isn’t exactly unheard-of in religious ceremonies—like ayahuasca, peyote, and psychedelic mushrooms sometimes used to induce religious “trances.” But this church seems like a bizarre mixture of Catholic tradition—a Virgin Mary statue still stands there—mixed with a decidedly non-Catholic idol like San Simón (who is apparently known for his mischief), alongside rituals like prayer candles and the burning of cypress needles along with tobacco. Haines even points to “black magic” practices like tossing sardine cans into a fire. When a can explodes, a curse is lifted: “Right on cue, a can burst.” All in all, it makes for a fascinating travelogue over at BBC.com today.